One of the reasons why I was interested in the Ham Radio Hobby is because of the strong "homebrew" contingent within the hobby. I just like it when people will fire up their brains, and their soldering irons, and build stuff. And I want to learn how to do that too. A good step towards that goal is to start doing kit builds, and to practice and improve my soldering skills, along with my ability to read and understand some fairly simple circuit schematics, and test and diagnose problems if my build goes awry. 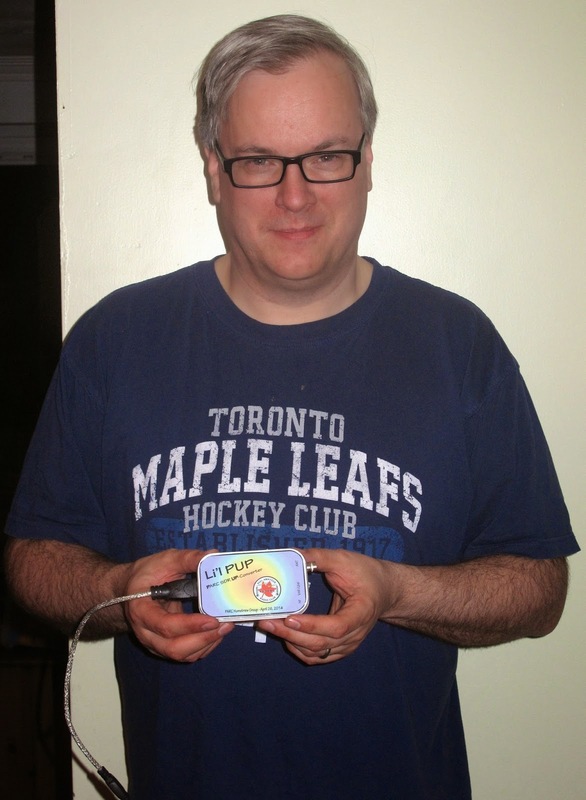 I signed up for a BuildAThon day with the Peel Amateur Radio Club (PARC), who are a really fun bunch of folks. I joined the PARC club, paid my dues, and signed up for a slot at the buildathon day. I obtained a soldering station, two actually, used, at a low price. I bought all the items on the "suggested things to bring" list, and I showed up at the buildathon day. * Obtain the necessary shared equipment, in this case, a reflow oven, a drill press, test equipment, and extra soldering stations. This is all done by volunteers. This is why Amateur Radio Clubs are so great. I'm so impressed by the HomeBrew group within the club, and with the PARC club all around. Well done, gentlemen, well done. Underneath the board you can see is a small pre-made assembly which is the inside of an "RTL-SDR dongle", the 50 mhz to 1.2 ghz SDR "brains" of the operation. 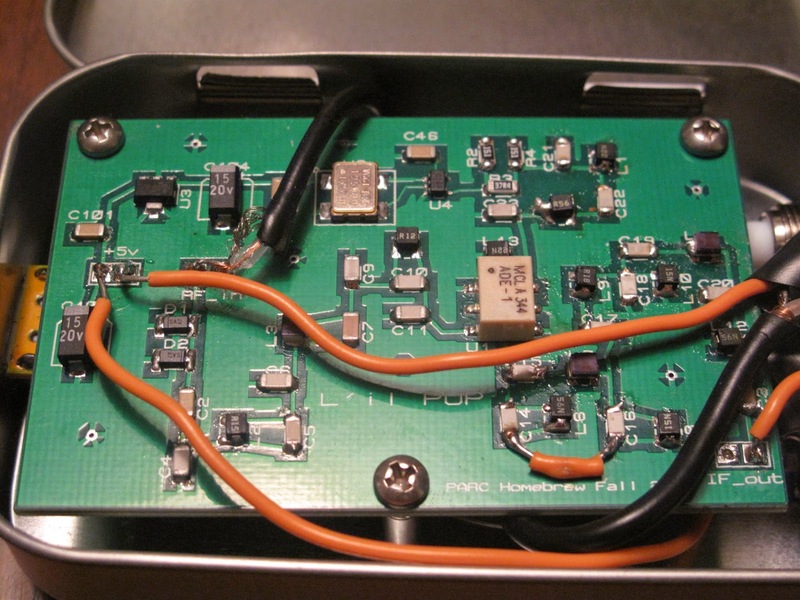 The green board on top is an upconverter that slides a segment of the RF spectrum from 1 to 80 mhz up to 125 mhz where the Realtek RTL-SDR chip can 'see' it. The upconverter design is an open hardware design from opendous.org, and the design was modified, and placed in a cool "Altoids tin" which, when closed up, makes a nice little enclosure. I am a big fan of ersatz kit enclosures, whether they be mint tins, or tuna tins, or what have you. I don't think I could have built this kind of kit, even if I purchased the board and the components in a big bag of stuff. I had a little trouble with the reflow, the oven didn't really get hot enough and there wasn't enough solder/paste on the right side of the board, so I needed a bit of help from a more experienced solderer to rework the right side of the board. You can see there is more solder over there because it was hand-soldered, whereas the left side seems to have reflowed properly. This is big fun, people, I highly recommend kit building, especially "kit building as a team sport". This was a really fun day, and I am now highly motivated to go try building a few kits on my own time, now that I've had a taste of kit-building success. The best part? My little radio works. There will be a post or two later when I've figured out enough software stuff to be able to show something new. I have some ideas, and since I'm a pretty able software developer, I think I might be able to do some nifty stuff with this little rig. I'm sitting here listening in and chiming in now and then, on 40 meters. I have a big grin on my face, and a microphone in my hand, and an HF rig warming up the room. This is really big fun. This is why I got into this hobby in the first place. I like radios. I like people. Bingo. I went to another hamfest today, and got a Signalink (Sound card interface) and tonight I made my first PSK (digital) contact, using PSK63, which is similar to PSK31 but wider bandwidth, using FLDIGI. If you don't know what those are, and you're interested, Google it. There are some great youtube videos introducing Signalink, PSK modes, and the FLDIGI program. This is REALLY awesome. I'm grinning from ear to ear. Preamble: I beg your indulgence as I go off on a not-very-ham-radio-related tangent. I will bring this back to relevance to the ham radio hobby, though. Some readers will immediately see the relevance to the Amateur Radio hobby, though, because they are smart people. I am 44 and I think I might be turning into Allie Fox, the character from Paul Theroux novel The Mosquito Coast. If you have not seen the movie, you have at least definitely run into Allie Fox at HamFests, or on the air on 40 meter rag-chewing on a Saturday night. He's the one complaining about how America has let herself get run down, and let everyone else get the better of her. He drives a 1950s Ford Pickup truck, he could repair that truck even if the whole world went away and he was left to his own devices, and he's a bit of a stickler for buying Made in America, and prone to ranting about the cheap crap we have everywhere. Today, I was trying to fix some dining room chairs that had been given to us for free, that were made at least partially of hardwood, probably walnut. They date from the mid 1970s, I’m guessing, and are constructed of parts that laminate a quarter inch of solid wood onto some kind of engineered substance, that once was sawdust and glue. Particleboard. Did you shudder as I used that word? Particleboard is what us non-wood-tech people call it, and these days, it’s known as an engineered wood product by those who wish to avoid the negative connotations that the term particleboard gives. The legs are fastened on using the same kind of dowels that everything from Ikea is constructed with, and with a daub of glue. Guess what happens to those legs as soon as a tiny amount of sheer-angle force is applied? The glue lets go, and you have a wobbly leg, and eventually you break the dowels and the legs fall off, and the person, perhaps of above average girth, falls on the ground. So, after grumbling about what cheap crap the free chairs are, and trying for a while to fix them, breaking all my drills and screws, I migrated to grumbling about what cheap crap the screws and drill bits I was using are. Everything was cheap crap, even if it was free to me and owed me nothing, being 40 years old, and all. Everyone was at fault, everyone but me. I heard myself ranting, and caught myself. We have, as a nation, as a society, as the affluent segment of the modern world, chosen to favor the big-box stores over the mom and pop stores, which in turn leads to some economic processes, which leads inexorably to the death of the small businesses that carried products they were familiar with, and could tell you something about. Instead, we have advanced chair substitutes, advanced substitutes for a 3 inch One-Eighth-inch diameter wood screw that look like a wood screw, but are made as cheaply as possible and which break off with the 5 pounds of torque it takes to turn a wood screw into a piece of laminate partial-hardwood-and-partial-particleboard. The thing is that if I had drilled proper guide and pilot holes before I began, the screw wouldn't have broken. If I had been more patient and set up a jig, the drill bit wouldn't have broken. But here I am on Good Friday with all the stores closed, and no cheap crap drill bits for sale, and what do I rant about? About someone else's responsibilities, not my own. What's the one thing I can do something about? About me. About how I live, about how I act, and about how I treat people. If I am good, the world becomes better. If am not good, the world becomes worse. I believe that this is at the heart of the Amateur hobby. Do good, and have a bit of fun while doing good, and everybody wins. I think that people should start taking personal responsibility for the quality of their wood, their hardware and basic supplies, and their food, the items they use for work and for hobbies, and the financial livelihoods. But it's more than that; I think that people, especially and only me, should care even more about hearts and minds, and about taking good care of people, and being good people, even more than they care about the quality of the two-by-fours in their lumber yards. You see that lumber yard is run by a person, or a couple people. People who may have families, spouses, and children. People who are people just like you and me. Even what you see as commercial, has a human side to it. It is the human side to this economic situation that I think is the most important thing. So, the part where Allie Fox is dead wrong is the part where he starts being a xenophobic racist jerk. I think we can take personal responsibility for our financial and commercial behaviours and the resulting effects of those decisions on the world, without any xenophobia, racism, protectionism, nor any of that "My Country Right or Wrong" crap. I heard someone who wanted to buy a radio, say, that they don’t want to buy any “cheap rice cracker brand” radios. That was a jab at the Japanese, who with brands like Kenwood, Yaesu, and ICOM, basically own a huge amount of the radio transceiver market these days. To these folks, perhaps, a Collins all-tube radio from the 1960s, a marvel of RF engineering for its time, and still a solid and fun device to use, and their first radio in high school, has a special place in their hearts. Fine. Good. All praise to the Collins fans, but don’t go dumping on Kenwood, Yaesu, and Icom, please. And please no racist insults about Asian people, products, or companies. I happen to have immense respect for the big-three Japanese radio brands. You want to know why they're so big? Because there are a lot of people in the amateur radio community in Japan. Frankly I think that's awesome. I hope to visit Japan some day, and maybe get to know a few Japanese hams on the air. Maybe I'll learn some Japanese. I am not one of those people who thinks that North American English Speaking People are Better than Everybody Else. I think Allie Fox thinks that though. Allie Fox rips himself off when he refuses to be friends with the rest of the good people of the world. Anyways, back to my point about buying locally without being xenophobic or racist. Let's look at the Ham Radio market. Collins is gone. Heathkit is gone. Hallicrafters is gone. The remaining American brands have carved out some pretty respectable engineering accomplishments this century. Elecraft, FlexRadio, and Ten-Tec come to mind as makers of some amazing radios that I would love to own. But inside those radios are integrated circuits made in the same fabs that the radios from Kenwood, Yaesu, and ICOM are using. You can wind your own coils, and you can wave-solder your own boards, and America still has some claim to fame in the engineering of ferrite materials, but the semiconductor business is totally global. We live in a world where the high-tech elements of our society are possible only through a global peaceful network of trade. Xenophobia, and fear of “foreign made” stuff is so last century. Let's be fans of American radio companies (and Canadian ones too) without being negative about anybody else's products. So what am I suggesting? I’m suggesting that each and every person ask themselves the question, “what kind of world do I want to live in, and how do my decisions affect the creation or destruction of the things that I wish to see strengthened, or weakened?”. I think it’s possible, for example, to live in a global trade ecosystem, without always choosing to go down the Big Box Store route. By Big Box Stores I mean not only WalMart, but also Ebay, and Amazon. One company or organization having a shocking amount of control over what I buy seems to me to be a bad thing. I want diversity of options and choices about what to buy, and from whom. I want to buy stuff locally when there are local knowledgeable suppliers. A great example of what I mean, in the Ham Radio hobby, is that there are a few makers and distributors and retailers of antennas and other radio gear located right near me (within 100 kilometres). If I always buy online and rely on cheap international shipping to obtain what I want, those stores, and those businesses will not survive. A second example of what I mean, an attitude that I think is present in the Ham community, that the wider world needs to learn a bit more of, is the old-school Yankee Ingenuity, often present in non-Yankees like my Dad and (some day maybe) in me, the desire to know how things work, how to fix them when they break, and to be able to shift for yourself if you have to, because sometimes, you do. Knowing how something works, and taking responsibility for fixing it, that is step one for me. Step two is to do it without grumbling and complaining about “who designed this awful crap?”. How about just saying, “well it looks like that would take this much force to break, and it got that, and it broke, so now what?”. Pragmatic, kindly, and results-oriented. Forward looking, instead of whining. Creative and curious and happy instead of resentful, and unhappy. Now that I own my own rig (a Kenwood TS-570D) I will soon return the borrowed Kenwood to the kind Ham who loaned it to me. I bought myself a Kenwood because I like how the radio is designed and controlled. Kenwood makes some fantastic rigs, and if I could afford a new one, I would buy one, or a new Elecraft K3 or a TenTec Eagle, but I can't afford any of the big brand prices yet. But now that I have a rig, I need a lot of stuff to go with it, and I will frequent my local ham shops, and antenna makers. I bought a G5RV from Maple Leaf Communications, and I heartily recommend them to anybody looking for antennas. Bob is a great guy, and makes great stuff, and knows a lot about his products. If you're reading this and you're in the Canada or the USA, check out your local dealers, makers, and sources. If you don't, they will eventually go out of business, and who are you going to ask for advice? If that shiny new rig costs $100 less online, consider the loss to the community if the local dealer can't keep his rent paid anymore, and has to close up shop. Keep the hobby fun, by keeping the hobby shops around. As another aspect of personal responsibility (combined with fun), I will homebrew and learn maintenance and repair of the electronics I own. As another part of doing good and having fun while doing good; I will be part of a community. I will try to whine a lot less, and be positive a lot more. If something breaks that doesn't make it crap, or anybody a bad person. So it broke. Just fix it. I will not turn into Allie Fox. If you want to, go ahead. I'll just go QSY or flip my radio off, and ignore you. I bought a used radio. One day later it's dead. This sure can be an expensive hobby some times. Total operating time, 3.8 minutes. Total cost $525. Total cost of ownership, $138 per minute. Update: In the morning, by suggestion of someone from the local club, I unplugged and replugged the speaker lead in three times, and the third time cleared whatever little metal bit was shorted or stuck before. Now I have audio again. Besides having a meltdown and feeling a bit shaky, I'm fine, and my radio is fine. That was not fun.